A Young Global Leader for the World Economic Forum, an Oprah’s Angel Network award recipient, a “TIME” Magazine 50 (Leaders) for the Future (94′), John Hope Bryant is an entrepreneur, the founder, chairman and chief executive officer of Operation HOPE, the Inc. Magazine/CEO Read bestselling author of “Love Leadership: The New Way to Lead in a Fear-Based World” (Jossey-Bass), advisor to the last two sitting U.S. presidents, a thought leader, public speaker, and an innovator in the business of empowerment. Raised in Compton and South Central Los Angeles, California and homeless for 6 months of his life by age 18, John Hope Bryant has traveled throughout North and South America, Africa, Asia, the Middle East, and Europe tirelessly promoting a sense of hope, self-esteem, love leadership, dignity, empowerment and opportunity for the under-served. Operation HOPE, America’s first non-profit social investment banking organization founded immediately following the Rodney King Riots of 1992 in South Central Los Angeles, now operates in 69 U.S. communities and South Africa, having served more than one million individuals, has more than 10,000 HOPE Corps volunteers, 5,000 partners from government, community (including faith) and the private sector, has raised more than $500 million and helped to restructure another $300 million in sub-prime mortgages from the private sector to empower the poor, for a total of approximately $900 million in economic activity for the under-served. Former U.S. President Bill Clinton described Mr. Bryant in his recent bestselling book “Giving” by saying, “John Bryant is a 41 year-old whirlwind of ideas and action. Lean, intense, focused, and completely positive in his belief in the potential of poor people to prosper, with ‘a hand up and not a hand out.’” A national community leader cited by the past four sitting U.S. presidents for his work to empower low-wealth communities across America, John Hope Bryant is one of the most authoritative and compelling advocates for poverty eradication in America today. John Hope Bryant has served on several corporate boards, is author of “Love Leadership” and “Banking On Our Future,” a book on youth and family financial literacy, serves as a member of the NYSE Euronext Financial Literacy Advisory Committee, a member of the advisory board for the Gallup Government Leadership Academy, is a former goodwill ambassador to the U.S. for the United Nations in Geneva, Switzerland, a partner with former U.S. President Clinton and his foundation in teaching financial literacy and promoting the Earned Income Tax Credit (EITC), and working with HOPE global spokesman Ambassador Andrew Young, is also a leader for a new movement bridging civil rights to silver rights. 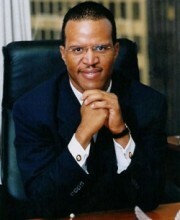 John Hope Bryant has received more than 400 awards and citations for his work to empower low-wealth communities including the Use Your Life Award by Oprah Winfrey, and was named a ‘Community Hero’ by “People” Magazine on the 10th anniversary of the worst urban civil unrest in U.S. history. In December, 1994, Mr. Bryant was selected by “TIME” Magazine for their ‘America’s 50 Most Promising Leaders of the Future’ cover story. In early 2008, Bryant’s silver rights advocacy and the work of Operation HOPE inspired the U.S. President to make financial literacy the policy of the U.S. federal government by Executive Order for the first time in U.S. history. On January 22nd, 2008, Mr. Bryant was appointed by then President George W. Bush as vice-chairman of the bi-partisan U.S. President’s Advisory Council on Financial Literacy, and chairman on the Committee on the Under-Served. Vice chairman until January 2010, Mr. Bryant proudly also served President Barack Obama in 2009 and 2010, respectively. Bryant’s Council leadership resulted in the creation of the new U.S. SBA Office of Entrepreneurial Education, a landmark U.S. Treasury Department issued report on the future of financial literacy and responsible sub-prime lending, and inspired legislation including HR1325 sponsored by Congresswoman Sheila Jackson-Lee (D-TX), which if enacted will require all college students to take a course in financial literacy, and compel every college and university to require one. Seeing this crisis in global dimensions, Mr. Bryant serves on the Global Agenda Council for the World Economic Forum, as an advisor on financial literacy and empowerment. On June 17th, 2009, Mr. Bryant convened a first-ever HOPE Global Financial Literacy Summit in Anacostia, an under-served neighborhood outside of Washington, D.C. The summit was attended by more than 850 delegates from 40 countries and 6 continents, and speakers included Federal Reserve Chairman Ben Bernanke, FDIC Chair Sheila Bair, White House Advisor Valerie Jarrett and civil rights icon Ambassador Andrew Young. On October 18th, 2009, Bryant was called to the historic Ebenezer Church in Atlanta, Georgia, pastoral home of Dr. Martin Luther King, Jr., to speak on his 5 Laws of Love Leadership, and “a bold new movement from civil rights to silver rights,” as Ebenezer’s 49th “annual Men’s Day” speaker. As a co-founder of Global Dignity, John Hope Bryant has conducted Dignity Day teaching sessions with youth and leaders in countries around the world, and with leaders such as Her Majesty Queen Rania of Jordan, Archbishop-Emeritus Desmond Tutu of South Africa, and HRH Crown Prince Haakon of Norway. On October 20th, 2009, GLOBAL DIGNITY DAY 09’ was held in 32 countries and six continents. On February 8th, 2010, Latvian President Valdis Zatlers received Mr. Bryant on behalf of the Republic of Latvia as the second-ever speaker for the distinguished Latvia Presidential ‘Lectures By World Leaders’ speaker series at Latvia University, on the topic of ‘Economic Reset.’ Professor Klaus Schwab, founder and chairman of the World Economic Forum served as the inaugural speaker. On June 29th, 2010, Mr. Bryant joined Archbishop-Emeritus Desmond Tutu in Cape Town, South Africa for the signing of a landmark agreement between the Anglican Church of Southern Africa and Operation HOPE, to reach and teach the 2 million youth of the Anglican Church (6 African countries) in a course in dignity, financial literacy and entrepreneurship. Mr. Bryant serves on the CEO Panel for USA Today Newspaper and writes regularly for the Huffington Post. Mr. Bryant received an Honorary Doctorate Degree of Human Letters from Paul Quinn College of Dallas, Texas and in April, 2008, as part of the Forum of Young Global Leaders, Bryant completed the Harvard University John K. Kennedy School of Government, ‘Global Public Policy and Leadership for the 21st Century’ executive education program. Mr. Bryant has received the National Community Service Award both from Spelman College and Livingstone College, both HBCUs. John Hope Bryant was born on February 6, 1966, at Good Samaritan Hospital in Los Angeles, California, and resides in Atlanta, Georgia. Mr. Bryant is a member of 100 Black Men of Atlanta and attends Ebenezer Church in Atlanta, Georgia.